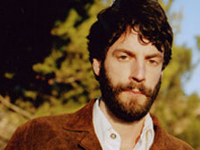 Ray LaMontagne was born in New Hampshire, but as he put it, his family was “just passing through.” His parents split up shortly after his birth, and his mother began a pattern of moving her six children wherever she could find employment and housing, which meant LaMontagne grew up as the perennial new kid in school (when and if he went to school at all). He did graduate high school, however, and found himself working in a shoe factory in Maine when he heard Stephen Stills’ “Tree Top Flyer” on the radio. The song amounted to an epiphany for LaMontagne, and he made up his mind on the spot to become a singer and musician.